An Expert Witness attends court to interpret and express opinions about facts relating to his knowledge and experience pertaining to his specific skill, industry or field of work or expertise. It is important that the expert witness be able to express himself in plain language which will aid the court (and/or the jury) in understanding interpretations and opinions – showing the court that the expert understands all aspects of his profession without having to resort to abstract professional jargon which could lead to further questioning, confusion, and, possibly, even loss of credibility. It is unnecessary that the expert be familiar with the intricacies of the law as it relates to expert testimony. It is his role to understand that the admissibility of his expert opinion is predicated on the existence of knowledge and experience that is beyond that of the ordinary citizen and is applicable to the litigation matter that has been brought before the court resulting in his presence and testimony. Testimony may be oral or written, and it is usually made by oath or affirmation under penalty of perjury. Reasons for using a report can vary on a case-to-case basis. Reports can help to get a more favorable settlement, support or oppose a motion for summary judgment; and, are usually required in civil cases in federal court. Written reports form the basis for pre-trial preparation, settlement negotiations and testimony during trial. They may lead to a decision not to call the expert witness, or a settlement which will prevent a trial altogether. Reports vary and may consist of a few paragraphs to many pages. 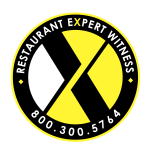 Restaurant Expert Witness – Howard Cannon is experienced in preparing well-written Expert Witness Reports and Opinions – knowing how to incorporate only what is necessary – avoiding gratuitous and unimportant or emotional commentary. Howard will clarify counsel’s request for a written opinion by requesting that counsel provide a scope of assignment; such as a list of questions or an outline of the issues that counsel would like the report to address – identifying the reason for the report, the matter to be explored, and his unbiased observations, methodologies, rationale, and opinions; in addition to other significant information and sources. Usually narrow in focus; may be used in connection with a motion (summary judgment, for example). Usually wide-ranging; defines the issues; and, sets forth all the shortcomings of the Defendant(s). Usually focused on rebutting plaintiff’s expert and addresses all issues raised by the opposing expert(s). Additional to a report already provided, correcting inaccuracies or completing a previous report based on information that was not available at the time of the initial disclosure. Federal rules mandate certain content – list of prior court testimony, experience/qualifications, compensation, basis for opinion. Admissibility of expert evidence governed by Federal Rule of Evidence 702; Expert Testimony must be “relevant to the task at hand” and rest “on a reliable foundation”. Unbiased/Objective Analysis & Reports – based on customarily relied upon restaurant, hospitality, and food service industry practices, and based on an opinion that is rock-solid and backed by industry research and information. Howard is not an advocate for your “side”, but instead provides a credible, objective professional perspective of the matter at hand. On Time – Mr. Cannon’s expert witness reports, affidavits, and opinions are always on time . . . he hits deadlines – period!